This Atlas shows that Britain’s national bird tied for second place as the most widespread species in Cheshire and Wirral, being present in the breeding season in 655 tetrads. The only significant difference from our First Atlas is that Robins now breed on Hilbre, but they are still missing from two of the highest tetrads. The national population, and probably that in the county as well, is much higher than twenty years ago. A succession of cold winters had hit their numbers and they reached a low point in the mid-1980s, just after our First Atlas, but since then the national population index has risen steadily and in 2004 it was half as high again as twenty years previously. The analysis of Breeding Bird Survey transects shows that this is our fifth most numerous species, with a breeding population of Cheshire and Wirral in 2004-05 of 147,520 birds (126,890-168,160), a mean of 220 birds per tetrad. The distribution across the county is relatively even: the abundance map shows the highest densities exceed 300 birds per tetrad while the lowest are around 100 per tetrad. In the best habitats, broadleaved woodland with dense understorey, densities can reach 1,000 pairs per tetrad, each pair living in an area averaging just 0.4 ha (1 acre) (Mead 1984). Robins also had one of the highest proportions of confirmed breeding, 87%. The majority of these, in 259 tetrads, came from fieldworkers seeing broods of recently-fledged young with their distinctive spotty plumage. Unfortunately some recorders included unaccompanied juveniles, not realising that they could have travelled some distance from their natal site, perhaps from an adjacent tetrad. In 218 tetrads observers logged parents carrying food or a faecal sac, with nests found in just 90 tetrads. A dedicated nest-finder of a former generation (Simson 1966) regarded the Robin as ‘just about the most cunning and secretive of our common birds’. Nests are usually in a dark spot, often in a bank, in a hole in a tree or an ivy-covered trunk, but many are in human artefacts. Near Hulme Walfield (SJ86M) Steve and Gill Barber were told by a farmer that he had moved a nest with eggs from a trailer he needed to use, but the nest remained active and young fledged. Their familiarity with man was shown by the recorded habitat codes, with most in human sites (a total of 35%, 21% being rural), followed by farmland (30%), woodland (27%) and scrub (7%). 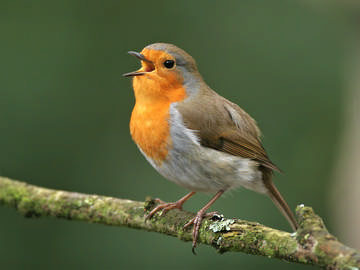 Robins eat mainly invertebrates in the breeding season, foraging mostly on or near the ground and feeding themselves and their young on any grubs and spiders that they can find.